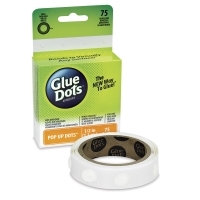 Glue Lines — As easy to work with as Glue Dots, Glue Lines are super-strength adhesive strips that are great for bonding irregularly shaped objects and hard-to-glue materials. The non-toxic, acid-free, lignin-free adhesive works well on paper, foam, plastic, metal, wood, glass, and more. 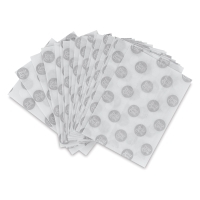 A perforated, transparent liner allows you to apply the strips with precision. 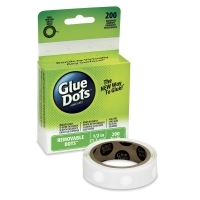 The roll includes 200, 1" Glue Lines. 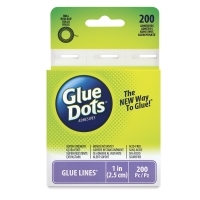 Ultra-Thin Glue Dots — Ideal for paper layering, bonding photos to cards, or assembling scrapbook pages, Ultra-Thin Glue Dots are acid-free and lignin-free. They measure 3/8" in diameter and come in sheets. 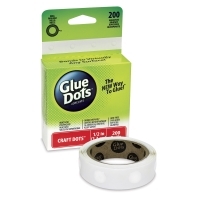 Original Glue Dots — Original Glue Dots come in rolls are are offered in your choice of three diameters — 3/16" Mini, 3/8" Memory Book, and 1/2" Craft. 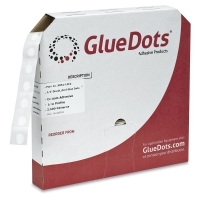 Pop Up Dots — These Glue Dots add 1/8" (3 mm) of height to your project. They come in rolls and measure 1/2" in diameter. 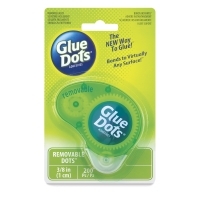 Removable Glue Dots with Dispenser — This disposable handheld dispenser is pre-loaded with 200 Removable (3/8") Glue Dots. It cannot accommodate replacement rolls. 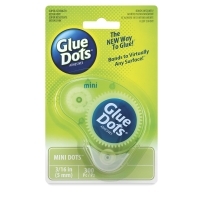 Mini Glue Dots with Dispenser — This disposable handheld dispenser is pre-loaded with 300 Mini (3/16") Original Glue Dots. It cannot accommodate replacement rolls. 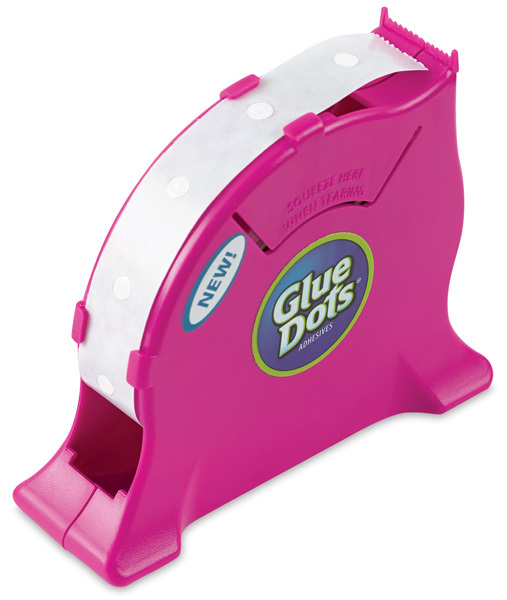 Desktop Dispenser — This refillable dispenser is the easiest way to apply and store Glue Dots and Glue Lines of all varieties. 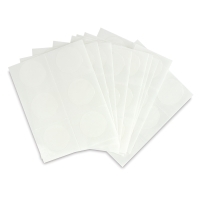 The lightweight body keeps rolls wound tightly and protects them from being crushed if stored in a bag, tote, or drawer. Non-skid feet hold the dispenser in place on any workstation. The easy-load design has multiple threading options to suit any working style. 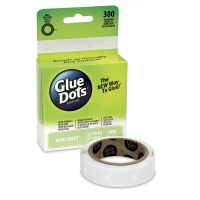 It comes pre-loaded with one roll of 300 Mini (3/16") Original Glue Dots. 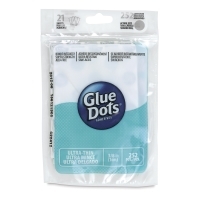 Removable Glue Dots — With a special removable adhesive, these Glue Dots can be easily detached without damaging surfaces or leaving a messy residue. 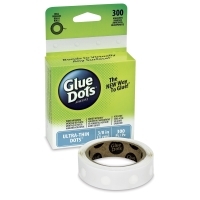 They measure 1/2" in diameter and come in rolls. 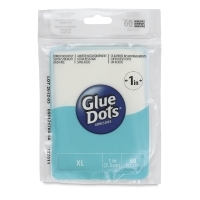 XL Glue Dots — XL Glue Dots are great for heavier materials like wood or metal embellishments, thick cardstock, fabric, or handmade papers. They measure 1" diameter and come in sheets.